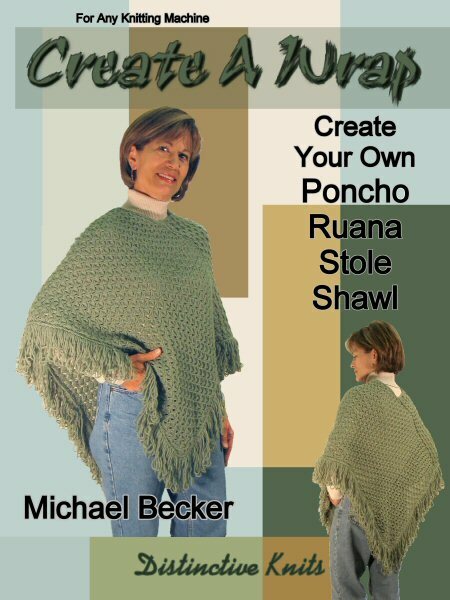 Make your own patterns for two different styles of Poncho, a Ruana, Stole and two different Shawls. The patterns in this book are designed for all knitting machines using any yarn and stitch pattern. The way it works is simple. You make a test square in the stitch pattern and yarn combination you wish to use. Get the gauge in stitches and rows. Each pattern has a template where you fill in the information about the test square. Follow the instructions about calculating the pattern using the gauge information. Your results will be the pattern to make the garment you have chosen. It's really easy to do. There is even a table to help you size ponchos so they look the way you want them to. You choose the length so they don't come out too long or too short. There are even solutions for length problems if it happens due to error. 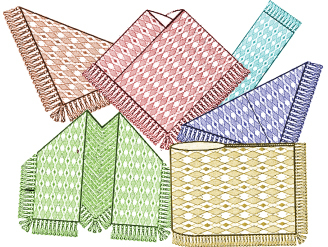 Stitch patterns, yarn and trim suggestions including a technique to knit the thickest knitted fringe ever, in both looped and cut styles in one or more colors. 26 pages stuffed full of great tips and tricks!